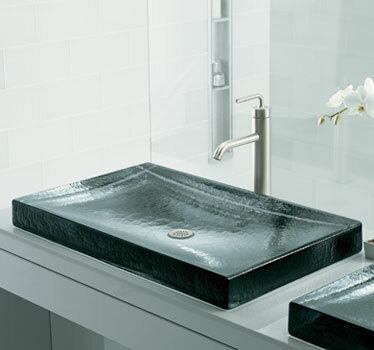 This cast glass lavatory sink from Kohler has slight ripples in the surface that captures light in a way that resembles water. The slab-like lavatory measures a generous 28×17 inches and stands 2 1/2 inches high. The Antilia lavatory is available in Ice and Storm colors. Kohler describes the Ice as resembling acompressed glacier ice. This sink joins two others in Kohler’s Nature’s Chemistry Line. Kohler has created this collection of natural products that transform indigenous materials, like metal , glass, clay and stone, into evocative fixtures for the kitchen and bath while retaining intrinsic properties. These are the coolest sinks ive ever seen ! really nice i want one ! Do you wholesale these glass sinks? I have a similar sink but I’d be interested to see what you have.